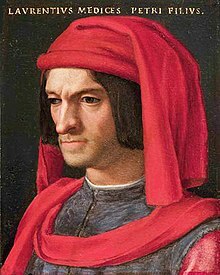 Lorenzo de' Medici (Italian pronunciation: [loˈrɛntso de ˈmɛːditʃi], 1 January 1449 – 8 April 1492) was an Italian statesman, de facto ruler of the Florentine Republic and the most powerful and enthusiastic patron of Renaissance culture in Italy. Also known as Lorenzo the Magnificent (Lorenzo il Magnifico [loˈrɛntso il maɲˈɲiːfiko]) by contemporary Florentines, he was a magnate, diplomat, politician and patron of scholars, artists and poets. 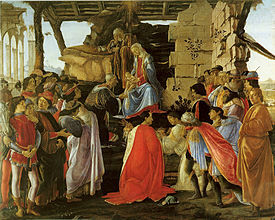 As a patron, he is best known for his sponsorship of artists such as Botticelli and Michelangelo. He held the balance of power within the Italic League, an alliance of states that stabilized political conditions on the Italian peninsula for decades, and his life coincided with the mature phase of the Italian Renaissance and the Golden Age of Florence. The Peace of Lodi of 1454 that he helped maintain among the various Italian states collapsed with his death. He is buried in the Medici Chapel in Florence. Lorenzo's grandfather, Cosimo de' Medici, was the first member of the Medici family to lead the Republic of Florence and run the Medici Bank simultaneously. As one of the wealthiest men in Europe, Cosimo spent a very large portion of his fortune on government and philanthropy, for example as a patron of the arts and financier of public works. 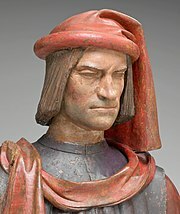 Lorenzo's father, Piero di Cosimo de' Medici, was equally at the centre of Florentine civic life, chiefly as an art patron and collector, while Lorenzo's uncle, Giovanni di Cosimo de' Medici, took care of the family's business interests. Lorenzo's mother, Lucrezia Tornabuoni, was a writer of sonnets and a friend to poets and philosophers of the Medici Academy. She became her son's advisor after the deaths of his father and uncle. 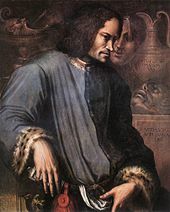 Lorenzo, considered the most promising of the five children of Piero and Lucrezia, was tutored by a diplomat and bishop, Gentile de' Becchi, and the humanist philosopher Marsilio Ficino, and he was trained in Greek by John Argyropoulos. With his brother Giuliano, he participated in jousting, hawking, hunting, and horse breeding for the Palio, a horse race in Siena. In 1469, aged 19, he won first prize in a jousting tournament sponsored by the Medici. The joust was the subject of a poem written by Luigi Pulci. Niccolò Machiavelli also wrote of the occasion, perhaps sarcastically, that he won "not by way of favour, but by his own valour and skill in arms". He carried a banner painted by Verrocchio, and his horse was named Morello di Vento. Piero sent Lorenzo on many important diplomatic missions when he was still a youth, including trips to Rome to meet the pope and other important religious and political figures. Lorenzo was described as rather plain of appearance and of average height, having a broad frame and short legs, dark hair and eyes, a squashed nose, short-sighted eyes and a harsh voice. Giuliano, on the other hand, was regarded as handsome and a "golden boy", and was used as a model by Botticelli in his painting of Mars and Venus. Even Lorenzo's close friend Niccolo Valori described him as homely, saying, "nature had been a stepmother to him in regards to his personal appearance, although she had acted as a loving mother in all things concocted with the mind. His complexion was dark, and although his face was not handsome it was so full of dignity as to compel respect." 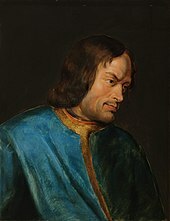 Lorenzo, groomed for power, assumed a leading role in the state upon the death of his father in 1469; when he was twenty. Already drained by his grandfather's building projects and constantly stressed by mismanagement, wars, and political expenses, the assets of the Medici Bank contracted seriously during the course of Lorenzo's lifetime. Lorenzo, like his grandfather, father, and son, ruled Florence indirectly through surrogates in the city councils by means of threats, payoffs and strategic marriages. He effectively reigned as a despot, and ordinary citizens had little political freedom. Rival Florentine families inevitably harboured resentments over the Medicis' dominance, and enemies of the Medici remained a factor in Florentine life long after Lorenzo's passing. The most notable of the rival families was the Pazzi, who nearly brought Lorenzo's reign to an end. On Easter Sunday, 26 April 1478, in an incident known as the Pazzi conspiracy, a group headed by Girolamo Riario, Francesco de' Pazzi, and Francesco Salviati (the archbishop of Pisa), attacked Lorenzo and his brother and co-ruler Giuliano in the Cathedral of Santa Maria del Fiore in an attempt to seize control of the Florentine government. Shockingly, Salviati acted with the blessing of his patron Pope Sixtus IV. Giuliano was killed, brutally stabbed to death, but Lorenzo escaped with only a minor wound to the shoulder, having been defended by the poet Poliziano. News of the conspiracy spread throughout Florence and was brutally put down by the populace through such measures as the lynching of the archbishop of Pisa and members of the Pazzi family who were involved in the conspiracy. In the aftermath of the Pazzi conspiracy and the punishment of supporters of Pope Sixtus IV, the Medici and Florence earned the wrath of the Holy See, which seized all the Medici assets that Sixtus could find, excommunicated Lorenzo and the entire government of Florence, and ultimately put the entire Florentine city-state under interdict. When these moves had little effect, Sixtus formed a military alliance with King Ferdinand I of Naples, whose son, Alfonso, Duke of Calabria, led an invasion of the Florentine Republic, still ruled by Lorenzo. Lorenzo rallied the citizens. However, with little support from the traditional Medici allies in Bologna and Milan, the war dragged on, and only diplomacy by Lorenzo, who personally traveled to Naples and became a prisoner of the king for several months, ultimately resolved the crisis. That success enabled Lorenzo to secure constitutional changes within the government of the Florentine Republic that further enhanced his own power. Thereafter, Lorenzo, like his grandfather Cosimo de' Medici, pursued a policy of maintaining peace, balancing power between the northern Italian states and keeping major European states such as France and the Holy Roman Empire out of Italy. Lorenzo maintained good relations with Sultan Mehmed II of the Ottoman Empire, as the Florentine maritime trade with the Ottomans was a major source of wealth for the Medici. Efforts to acquire revenue from the mining of alum in Tuscany unfortunately marred Lorenzo's reputation. Alum had been discovered by local citizens of Volterra, who turned to Florence to get backing to exploit this important natural resource. A key commodity in the glass-making, tanning and textile industries, alum was available from only a few sources under the control of the Ottomans and monopolized by Genoa before the discovery of alum sources in Italy at Tolfa. First the Roman Curia in 1462, and then Lorenzo and the Medici Bank less than a year later, got involved in backing the mining operation, with the pope taking a two-ducat commission for each cantar quintal of alum retrieved and ensuring a monopoly against the Turkish-derived goods by prohibiting trade in alum with infidels. When they realized the value of the alum mine, the people of Volterra wanted its revenues for their municipal funds rather than having it enter the pockets of their Florentine backers. Thus began an insurrection and secession from Florence, which involved putting to death several opposing citizens. Lorenzo sent mercenaries to suppress the revolt by force, and the mercenaries ultimately sacked the city. Lorenzo hurried to Volterra to make amends, but the incident would remain a dark stain on his record. The Angel appearing to Zacharias in the Tornabuoni Chapel in Florence contains portraits of members of the Medici Academy: Marsilio Ficino, Cristoforo Landino, Agnolo Poliziano and either Demetrios Chalkokondyles or Gentile de' Becchi. 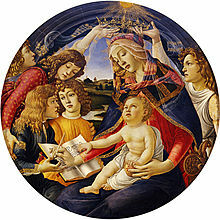 Lorenzo's court included artists such as Piero and Antonio del Pollaiuolo, Andrea del Verrocchio, Leonardo da Vinci, Sandro Botticelli, Domenico Ghirlandaio and Michelangelo Buonarroti, who were instrumental in achieving the 15th-century Renaissance. Although Lorenzo did not commission many works himself, he helped these artists to secure commissions from other patrons. Michelangelo lived with Lorenzo and his family for three years, dining at the family table and participating in discussions led by Marsilio Ficino. Lorenzo himself was an artist and wrote poetry in his native Tuscan. In his poetry, he celebrates life while acknowledging with melancholy the fragility and instability of the human condition, particularly in his later works. Love, feasts and light dominate his verse. Cosimo had started the collection of books that became the Medici Library (also called the Laurentian Library), and Lorenzo expanded it. Lorenzo's agents retrieved from the East large numbers of classical works, and he employed a large workshop to copy his books and disseminate their content across Europe. He supported the development of humanism through his circle of scholarly friends, including the philosophers Marsilio Ficino, Poliziano and Giovanni Pico della Mirandola. They studied Greek philosophers and attempted to merge the ideas of Plato with Christianity. Apart from a personal interest, Lorenzo also used the Florentine milieu of fine arts for his diplomatic efforts. An example includes the commission of Ghirlandaio, Botticelli, Pietro Perugino and Cosimo Rosselli from Rome to paint murals in the Sistine Chapel, a move that has been interpreted as sealing the alliance between Lorenzo and Pope Sixtus IV. Lorenzo adopted his nephew Giulio di Giuliano de' Medici (1478–1534), the illegitimate son of his slain brother Giuliano. In 1523, after serving four years as ruler of Florence, Giulio ascended to the papacy as Pope Clement VII. Detail of Domenico Ghirlandaio's Confirmation of the Franciscan Rule from the Sassetti Chapel frescos. Mounting the stairs in the forefront are the tutor of Lorenzo's sons, Angelo Poliziano, and Lorenzo's sons Giuliano, Piero and Giovanni, followed by two members of the Humanist Academy. During Lorenzo's tenure, several branches of the family bank collapsed because of bad loans, and in later years he got into financial difficulties and resorted to misappropriating trust and state funds. Lorenzo died during the late night of 8 April 1492, at the longtime family villa of Careggi. Savonarola visited Lorenzo on his death bed. The rumour that Savonarola damned Lorenzo on his deathbed has been refuted in Roberto Ridolfi's book, Vita di Girolamo Savonarola. Letters written by witnesses to Lorenzo's death report that he died peacefully after listening to the Gospel of the day. Many signs and portents were claimed to have taken place at the moment of his death, including the dome of Florence Cathedral being struck by lightning, ghosts appearing, and the lions kept at Via Leone fighting one another. Lorenzo was buried with his brother Giuliano in the Church of San Lorenzo in the red porphyry sarcophagus designed for Piero and Giovanni de' Medici, not, as might be expected, in the New Sacristy, designed by Michelangelo. The latter holds the two monumental tombs of Lorenzo and Giuliano's less known namesakes: Lorenzo, Duke of Urbino, and Giuliano, Duke of Nemours. According to Williamson and others, the statues of the lesser Lorenzo and Giuliano were carved by Michelangelo to incorporate the essence of the famous men. In 1559, the bodies of Lorenzo de' Medici ("the Magnificent") and his brother Giuliano were interred in the New Sacristy in an unmarked tomb beneath Michelangelo's statue of the Madonna. Lorenzo's heir was his eldest son, Piero di Lorenzo de' Medici, known as "Piero the Unfortunate". In 1494, he squandered his father's patrimony and brought down the Medici dynasty in Florence. His second son, Giovanni, who became Pope Leo X, retook the city in 1512 with the aid of a Spanish army. In 1529, Lorenzo's nephew Giulio – whom Lorenzo had raised as his own son and then reigned as Pope Clement VII – formalized Medici rule of Florence by installing Alessandro de' Medici as the city's first hereditary duke. Lorenzo de' Medici is depicted as a teenager in CBBC's Leonardo, played by actor Colin Ryan. Lorenzo de' Medici appears as a supporting character to the protagonist in Assassin's Creed II. Lorenzo de' Medici is portrayed by Daniel Sharman in the TV series Medici: Masters of Florence. Lorenzo il Magnifico is a board game about Florence during the Renaissance that features Lorenzo and his contemporaries. ^ Picotti, Giovanni Battista (1934). "Medici, Lorenzo de', detto il Magnifico". Enciclopedia Italiana. Retrieved 10 May 2018. ^ Parks, Tim (2008). Medici Money: Banking, Metaphysics, and Art in Fifteenth-Century Florence. New York: W.W. Norton & Co. p. 288. doi:10.1111/j.1467-8357.2005.00614.x. ^ "Fact about Lorenzo de' Medici". 100 Leaders in world history. Kenneth E. Behring. 2008. Retrieved 15 November 2008. ^ Kent, F. W. (28 December 2006). Lorenzo De' Medici and the Art of Magnificence. USA: JHU Press. p. 248. doi:10.1086/586785. ISBN 0-8018-8627-9. JSTOR 43445687. ^ Brucker, Gene (21 March 2005). Living on the Edge in Leonardo's Florence. Berkeley: University of California Press. pp. 14–15. doi:10.1177/02656914080380030604. JSTOR 10.1525/j.ctt1ppkqw. ^ Milligan, Gerry (26 August 2011). Lucrezia Tornabuoni. Oxford Bibliographies. Oxford University Press. doi:10.1093/OBO/9780195399301-0174. Retrieved 25 February 2015. ^ Durant, Will (1953). The Renaissance. The Story of Civilization. 5. New York: Simon and Schuster. p. 110. ^ Davie, Mark. "Luigi Pulci's Stanze per la Giostra: Verse and Prose Accounts of a Florentine Joust of 1469". Italian Studies. 44 (1): 41–58. doi:10.1179/007516389790509128. ^ Machiavelli, Niccolò (1906). The Florentine history. 2. London : A. Constable and co. limited. p. 169. ^ 1454–1494., Poliziano, Angelo, (1993). The Stanze of Angelo Poliziano. University Park, Pa.: Pennsylvania State University Press. pp. x. ISBN 0271009373. OCLC 26718982. ^ Niccolò Machiavelli, History of Florence, Book VIII, Chpt. 7. ^ Janet Ross. "Florentine Palaces & Their Stories". 14 August 2016. Page 250. ^ Walter, Ingeborg (2013). "Lorenzo der Prächtige: Mäzen, Schöngeist und Tyrann" [Lorenzo the Magnificent: Patron, Aesthete and Tyrant]. Damals (in German). Vol. 45 no. 3. p. 32. ^ a b c Reinhardt, Volker (2013). "Die langsame Aushöhlung der Republik" [The Slow and Steady Erosion of the Republic]. Damals (in German). Vol. 45 no. 3. pp. 16–23. ^ Guicciardini, Francesco (1964). History of Italy and History of Florence. New York: Twayne Publishers. p. 8. ^ a b c Thompson, Bard (1996). Humanists and Reformers: A History of the Renaissance and Reformation. William B. Eerdmans Publishing Company. pp. 189 ff. ISBN 0-8028-6348-5. ^ Jensen, De Lamar (1992). Renaissance Europe: Age of Recovery and Reconciliation. Lexington, Mass: D.C. Heath and Company. p. 80. ^ Durant, Will (1953). The Renaissance. The Story of Civilization. 5. New York: Simon and Schuster. p. 125. ^ Hancock, Lee (2005). Lorenzo de' Medici: Florence's Great Leader and Patron of the Arts. The Rosen Publishing Group, Inc. p. 57. ISBN 1-4042-0315-X. ^ Martines, Lauro (2000). April Blood: Florence and the Plot Against the Medici. Oxford University Press. ^ Inalcik, Halil (2000). The Ottoman Empire: The Classical Age 1300–1600. London: Orion Publishing Group. p. 135. ISBN 978-1-84212-442-0. ^ de Roover, Raymond (1963). The Rise and Decline of the Medici Bank, 1397–1494. Harvard University Press. pp. 152–154. ^ Machiavelli, Niccolò (1906). The Florentine history. 2. London : A. Constable and co. limited. pp. 197–198. ^ Durant, Will (1953). The Renaissance. The Story of Civilization. 5. New York: Simon and Schuster. p. 112. ^ a b Schmidt, Eike D. (2013). "Mäzene auf den Spuren der Antike" [Patrons in the footsteps of Antiquity]. Damals (in German). 45 (3): 36–43. ^ Brucker, G., ed. (1971). The Society of Renaissance Florence: A Documentary Study. New York: Harper & Row. p. 27. ^ a b c d e f Tomas, Natalie R. (2003). The Medici Women: Gender and Power in Renaissance Florence. Aldershot: Ashgate. pp. 7, 21, 25. ISBN 0754607771. ^ J.N.D. Kelly, The Oxford Dictionary of Popes (Oxford 1986), p. 256. ^ Hugh Ross Williamson, p. 268. ^ "Leonardo: Colin Ryan plays Lorenzo". BBC. 28 March 2011. Retrieved 17 May 2018. ^ Kelly, Andy (9 March 2017). "Revisiting the renaissance with Assassin's Creed 2". PC Gamer. Future US, Inc. Retrieved 10 May 2018. ^ Truitt, Brian (19 March 2014). "Who's who in 'Da Vinci's Demons' Season 2". USA Today. Retrieved 10 May 2018. ^ Clarke, Stewart (10 August 2017). "Daniel Sharman and Bradley James Join Netflix's 'Medici'". Variety. Penske Business Media, LLC. Retrieved 11 August 2017. ^ "Lorenzo il Magnifico". Retrieved 8 March 2019. André Chastel, Art et Humanisme à Florence au temps de Laurent le Magnifique (Paris, 1959). Peter Barenboim, Michelangelo Drawings – Key to the Medici Chapel Interpretation (Moscow, Letny Sad, 2006) ISBN 5-98856-016-4, is a new interpretation of Lorenzo the Magnificent' image in the Medici Chapel.